Leading Manufacturer of felt spindles from Jaipur. 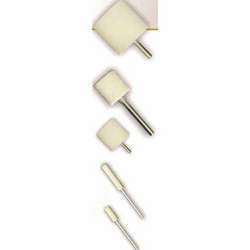 We offer high quality Felt Spindles basically used for polishing metals, Jewelry, stones and marbles. These felts have the specialized property of removing all scratches from the surface of hard metals. A number of industries place demands for these felts that we offer in the form of spindles. As we being the prominent manufacturer of felts for specific uses, our felt spindles for polishing are preferred by households, jewelers, marble and stone industries. We offer these in cost effective prices. Packaging Details: Packed in plastic box & cartoons. Looking for Felt Spindles ?